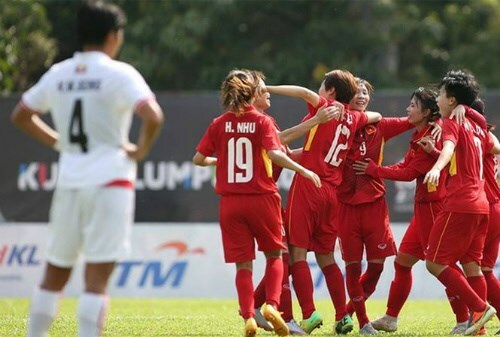 Hanoi (VNS/VNA) - The Vietnamese women’s football team have a golden opportunity to advance to the next round of the Tokyo 2020 Olympic qualification in Uzbekistan this week. The second round of qualifying will kick off on April 3, with defending Southeast Asian champions Vietnam in Group B together with Hong Kong, Jordan and the hosts Uzbekistan. Speaking with reporters after their first training session in the national’s capital in Tashkent this weekend, coach Mai Duc Chung said: "Players need time to get familiar with the weather and environment here. We have to prepare well for the matches." "Apart from Uzbekistan, who we have not played before, the other teams are at the same or lower level compared to Vietnam, who are the world No 35 and No 6 in Asia. In 2014, we beat Hong Kong at the Asian Games in the Republic of Korea. Last year we defeated Jordan at the Asian Championship qualifier," he said. Chung however pointed out that all three teams were in better physical condition than Vietnam, who had been working on their conditioning for a month. Prior to the Tashkent event, Vietnam took part in a six-day training camp in Myanmar, winning one and losing one friendly to the Myanmar women, which according to coach Chung were good warm-ups for his team. "We are in the process of rejuvenation so the players are not given any target for this qualification. They are just asked to learn what they can for the future. However, overall Vietnam still have a chance to overcome this challenge," he said. Vietnam will play Uzbekistan in the first match on April 3 at the Lokomotiv Stadium. In this second qualifying round, the winners of the three groups will advance to the third and penultimate round of qualification.